Bust: Measure at fullest point of bust. Make sure tape is level. Waist: Measure around natural waistline. Hips: Measure around fullest point of hips keeping legs together. Low hip placement is 8" below waist line (7.5" for Petite). Inseam: Measure from crotch down to desired length with shoes on. See each pant for lengths offered. If your measurements fall into more than one category, order the size which fits the critical area on the body. 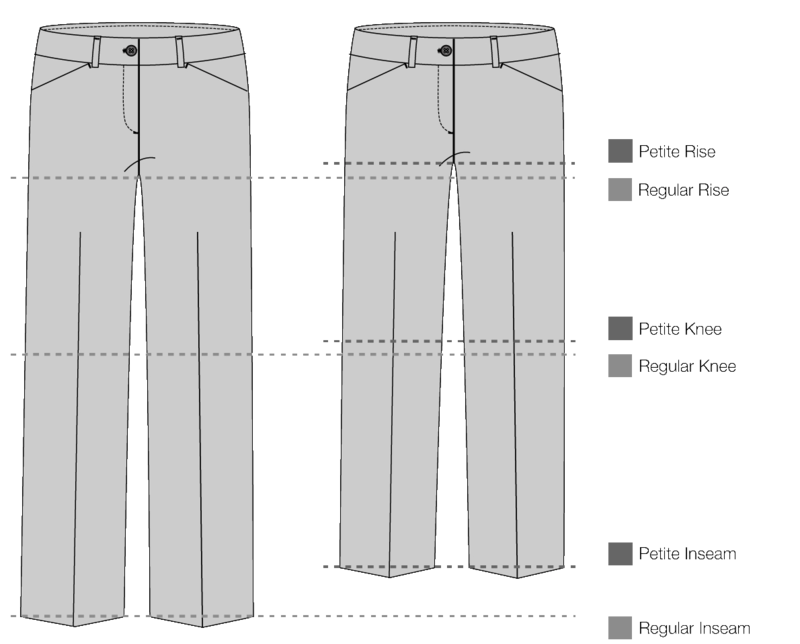 Critical areas for pants: Waist, hips, and inseam. Critical areas for skirts: Waist and hips. Critical areas for belt: Waist. Critical areas for shirts, sweaters, jackets and dresses: Bust and hips. Average height from 5'3.5" - 5'7"
Petite Tops and Bottoms are proportioned to exclusively fit the 5'3" and under woman. Petite clothing flatters a woman's shorter frame with a size appropriate cut, adjusted from the regular size.